This week on Taking The Myth, Stephen Knight (@GSpellchecker) and Iram Ramzan of sedaa.org (@Iram_Ramzan) discuss the big topics. We talk about Donald Trump overload, children at political protests, the Muslim Ban, Milo Yiannopoulos’s child abuse comments, Ronald Fiddler, Oldham Trojan Horse plot, integration, Piers Morgan V Jim Jefferies, FGM prosecutions and much, much more! Recorded on Wed 22nd Feb 2017. Milo is a total wanker and has likely tried the US because he knew he was either seen-through here, or knew he didn’t have a real fan base. A bandwagon-jumper with a weird speaking/presentation style that creeps me out. The Ronald Fiddler thing at least had Blair speaking up. His main point may have been the hypocrisy of the Daily Mail, but his side inserts about “Human Rights” organisations campaigning for the total innocence of the detainees, needs focus too. His comments about lots to answer about why on earth they were picked up where they were and the “anxiety” of their true affiliations should be very much noticed. They can always do this when out of office, but never when in – why? because he doesn’t need votes anymore. I know that CAGE have lots of “We celebrate the release of Mr x from Guantanamo” on their website, but has anyone noticed if they have recently deleted one? Trump is becoming less fun. It might be because they have finally locked his phone in a cupboard. But he’s been a bit…..normal, for about 3 or 4 days, that is since that press conference. The news outlets just don’t seem sure what to do with him. LBC today had a piece on his apparent pulling back on “Transgender toilets” or something (which apparently Obama was bringing in), and “Is he anti-semitic?” which seemed to be very tentative on anything he had ever said. I see it all calming down a bit. All good and well but im not sure about your comments on Yianopoulos. The phenomena of Trump, Milo and the hijab as a western symbol of feminism is hardly surprising. 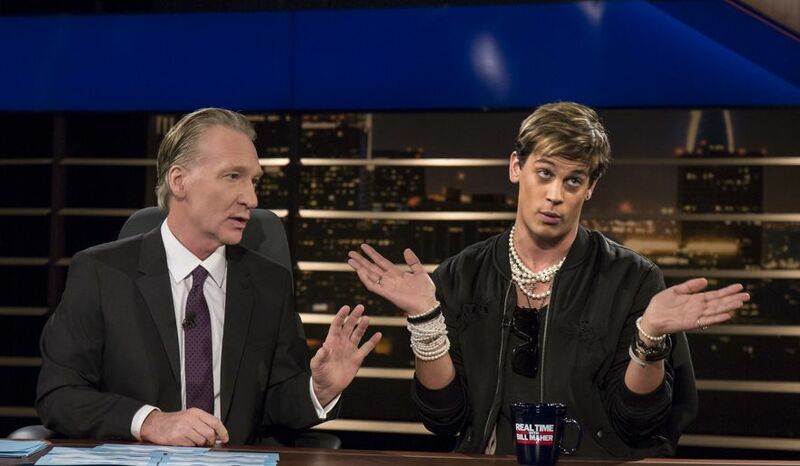 The thing about Milo is he is very intelligent. Most commentators wouldnt dare to debate him in a face to face interview because they know they would end up looking stupid (Bill Maher to his credit took him on and managed very well by using humour and rational argument instead of stupid abuse). Of course he says outrageous things like Trump just to get attention. But the way for intelligent people to deal with him is to answer his statements effectively instead of just abusing him in a meaningless way. Milo amuses me greatly because he cleverly mocks the whole Liberal PC modus operandi. What Liberals do is put the PC stamp of approval on entire groups of people (Identity politics) eg Blacks, Women, Gays. What this does is make it very difficult to criticise these people in any way. They are effectively off limits to any mainstream cultural outlets. Milo has exploited this system very well by emphasising his Gay label in the most explicit and crude manner deliberately to provoke liberals and as a result he has got away with murder and it serves the Liberals right for the stupid, dictatorial way they have tried to engineer society for so long. Liberals have been very successful at this for the last 50 years but since 9/11 people have finally realised that the Liberal Utopian goal of this delicate, civilised little global village that they have been championing for so long is probably not going to happen after all. People are saying ‘Whats the point of tiptoeing around on eggshells to protect all the world’s monorities just for the sake of a goal that has become unreal and not going to happen anyway? Why not just say what we really think and feel and be done with it?’ This novel experience has been such a revelation to so many people that they have almost gone to the other extreme of free speech.